So my fabulous six week European trip has finally come to an end. To be honest, I’m happy to be going home. I’ve been gone a long time, but unlike when I’m at school, I’ve been living in a foreign country, where I didn’t really speak the language to begin with. I’m probably going to be paying my mom back for a century for this trip, but it was well worth it and I would do it all over again in a heart beat! It was a once in a lifetime chance, and I’m so glad I took it. Sure, I may get to come back to Europe and Italy and Spain, but not like this. My trip definitely had it’s fair share of stressful moments, starting from day one at MCO dealing with JetBlue and their tardiness, which almost caused me to miss my flight to Rome. Then there was the Heineken not so Jammin’ Festival, complete with hail and whirlwinds. Then there was the whole drunkenly scaling the gate thing and falling off and busting my knee (which still hurts btw). Oh, let’s not forget when I went to the wrong airport the other day to go to Granada, fyi, there are two airports in Barcelona, don’t mix them up. And then today I decided since I had time to kill I’d walk around and look at the stores. I hopped on a monorail to the other gates. When I tried to come back, the monorail doors wouldn’t open. And I was stuck inside!! I was really worried for about 5 minutes there. Then I had to go through security again…grr... But for every stressful moment, there have been at least 50 hilarious, outrageous, and amazing memories. I am so lucky to have gotten the chance to come here! In six weeks I lived in Rome, sailed the Mediterranean, saw the leaning tower of Pisa, did a Pub Crawl, saw Venice, survived a mini natural disaster, went to SPAIN! Partied on a beach til the break of dawn in Barcelona, relaxed in Granada, spent a night in Madrid and made tons of new friends!! Now that I think about it, I’m exhausted! There was a little bit of trouble getting here though. i booked a SUUUPER cheap flight (5 euros, but then fees and taxes made it 45 euros) but didn't see the fine print where it said you could only have 15 kgs of checked baggage. total. mine were abouttt...20 kilos over, and i had to pay 8 euros per kilo...that came to about ohhh 160 euros. that really upset me, and i started to cry . i was doing so well with the cheap flight and hotel (it's only $50 per person a night for 3 nights, not too shabby) and then had to pay for extra baggage weight, i might as well have sent most of it home for 200 euros. i'm going to look into it for the flight back to Rome to make sure i don't have that problem again. Sam bought a Spain book and we've been reading all about it. apparently tonight is some huge festival for barcelona, and it's one big party all night long, complete with fireworks! :) we got really lucky with that. also, we saw a guy ryan from our program at JCU at the airport, so we're gonna hang out with him and maybe some other people he said were coming. after 3 nights here, sam and i are going to go to madrid for 3 nights and then i fly back to rome to catch a flight to jfk to catch a flight to orlando. that's going to be a super long day for me! but for now, i'm having a great time!!! If i had to desrcribe this weekend in one word, i think it would have to be crazy. this weekend started with a 4am wake up call to catch a 6:30 am flight to venice for the highly anticipated heineken jammin' festival. there was a pretty big group of us and we were all pumped! (although there was some mourning for some, because they lost all their liquids at security) So we arrive in venice and make our way to our hostel. This is where the first bit of drama errupted. There were two different rooms, one had air-conditioning and a private bathroom and shower, while the other did not. I was fortunate (read: smart enough) to book the one that clearly said "3-bed private bathroom ensuite". the other group was not so lucky. they were pretty pissed and were not about to let us have the better room. we tried saying it would be fine, they would only use it sleeping anyways seeing as we were going to be out all day at the concert, and they could use our shower. but whatever. it was still pretty early in the morning and the mainstage bands didn't go on til night time, so we decided to go into venice and tour a bit. two of the girls in the other hostel room were still upset about that whole situation and were pissy the whole time. we went to the murano glass island which was TONS of fun and full of pretty things. then we decided to head to the concert grounds, where we figured we'd get a head start on the drinking. we ended up buying these little green half tent thingies because we didn't want to sit on the grass, they turned out to be the best investment of our lives. The clouds started rolling in not long after that, and even though we knew it was going to be kind of rainy that day, we were in no way prepared for what was going to happen. My Chemical Romance is setting up to play, The Killers' music video is on the big screens and blasting through the park, and we're all just chilling and having a great time with the other 150,000 people. It starts to rain a little, and we're thinking, "ok, no big deal, cools things down anyways". then it turns into more or a pouring kind of rain, this is when my friend maria and i decide to pull the top part of the tent down further to keep the rain from hitting us. then it's a torrential downpour, and we pull the top all the way down to the ground, and we're holding it down. we're still joking around and having a good time and enjoying the beer. the winds started picking up and all of a sudden it wasn't so funny anymore, and turned into more of a scared shitless feeling. it felt like someone was standing in front of our tent throwing buckets of ice at us, and it hurt because we're trying to hold this thing down, and ice is being pelted on our arms through the tent. wind was intense, the hail was the size of ping pong balls, and people were screaming all around us. we were really scared. my poor friend alicia was all by her self in another tent right next to us, and kept calling to us to make sure we were still there. the whole thing lasted about 15 minutes, and when we finally emerged it was major chaos. the big towers holding the speakers, and big screens up had all collapsed, taking people with them and crushing others. ambulances were howling all around us and over 150,000 people were trying to make sense of what had just happened. it was all so surreal, and most of us were in shock. we were all pushed out of the park and the concert was cancelled for the day. but the bridge was shutdown, and nothing was running, so we joined this huge mob of people walking towards our hostel. we walked 7km to our hostel. seven. it took us about 3.5-4 hours to do. it was crazy. we were so exhausted when we got back, we showered, ate dinner at the restaraunt and went to bed. and that was just day 1.
this trip has made me realize just how much i hate being dependent on other people. money has just been going through my fingers like water, and i feel terrible because it's my mom's money. it's made me realize just how badly i need to have a steady income, preferably a large one. i don't like spending money with no source to fill up my bank account. i think this will be a good inspiration for me to get out there and work hard and get a job that can maintain my lifestyle....thoughts? i'll be on the lookout this weekend, maybe even lucky enough to snap a few photos of gee dubs. Hello all! i had an absolutely craaazy weekend!! it started thursday night and lasted pretty much all the way til last night. All of my roommates were out of town, so i decided to spend the wekend at my friends' place. we went out thursday night and didn't get in til late, and then after two hours of sleep we were up and ready to be at the train station by 6:15am....yeah, that was rough. but we a good day! we went to Pisa and saw the leaning tower which was really cool. we were excited once we saw the train because the inside was very harry potter style, meaning we had our own little compartment. haha. we're such dorks. we walked around more after lunch and then eventually headed back to the station, getting just a little lost in the process. the train ride home was longer but cheaper. so that was good. we were all pretty exhausted and didn't do much that night. the next day we were all over rome. i saw my brother at the vatican, got gelato at Old Bridge (supposed to be the best gelato in rome, it was pretty good, and pretty cheap too). 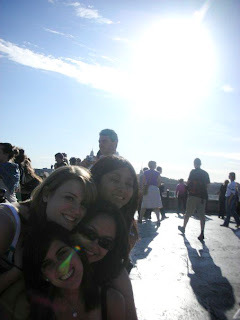 then we just kind of wandered and ended up on top of the castel di san angelo. which was...breathtaking. you could see all of rome from that spot. That night we did a pub crawl...the first hour is all you can drink beer and wine, so we decided to make the most of it and make it last all night. that we did. we were out dancing til 3am! it was a lot of fun, but eventually the club started playing this horrible 80s techno mix thing that was not good at all. also, my feet were killling me from all the walking around in my cute (but definitely not made for walking) shoes. and i was tired. so all that combined at 3am, made it not so fun anymore and i was ready to go. the next day, we slept til 12. haha. it was a crazy weekend . we were tired...so shoot us. we were supposed to do a bike tour around rome on sunday. when we finally woke up it was raining and we were way too tired (not to mention a bit hungover...)to even think about biking. oh, but the craziness continues. we decided to go get breakfast (there was a big argument about whether to go shopping, or just across the street to a little pizza place, the shopping team won) and all of us walked out the door and then realized NO ONE HAD A KEY! in italy, you have to go through a series of doors before you can actually reach your own. usually, a key to the building and a key to a gate as well. you'd think that once we realized we had no key we wouldn't proceed to walk out of the building therefore leaving us no way to even get back in! lol we're kinda special. so some of us went to call JCU emergency number and the others stayed. lol...we finally get the key, and make our way down to the grocery...only to find it's closed. we ended up at the little pizza place across the street. the original plan. oops.